When I relaunched this blog I did it with the intention of it one day becoming my full time job. I also did it so that I could practice my passion more: writing. I had veered so far off course from what I originally intended my profession to be that hammering out a few lines felt stiff and unnatural. As time progressed I felt the words flow more freely through my fingertips and I was more and more eager to continue to work on this. I realized the more time I spent writing the happier I seemed to be. Never mind the aching carpel tunnel developing in my arms. I was happy. This is what I had been called to do. It was during this time that my reading interests began to change. I started to read books geared towards the entrepreneurial heart, business books, financial books, and self-help books in the realms of how to become a better person both inside and out. I was so inspired by what I read that I wanted to share one particular book with you. 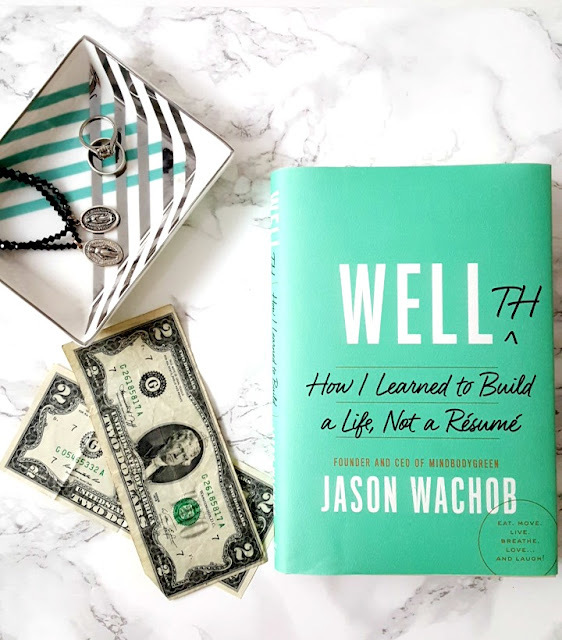 Wellth was written by Jason Wachob. In it he coins the term 'wellthy' in which he describes it as "the importance of well-being to you (thy) and to us all". He advocates for a happy and healthy lifestyle in which we work for a purpose, not just financial wealth. In this book he highlights the points that will take you to this holistic lifestyle. He believes it is formed through 13 steps: eat, move, work, believe, explore, breathe, feel, love , heal , thank, ground, live, and laugh. I loved what he had to say about all of them but I will focus on the two areas that spoke to me the most: believe and thank. Believe: I remember one time my boss questioned how much money I made while I signed my contract for the upcoming year. He said I made a lot of money. I didn't bat an eye and told him I was worth it. It wasn't the first time a remark like that was made to me in reference to my salary and my answer was always the same. I was never apologetic about it. Instead I was proud of myself for having it. I went in on my hiring date knowing how much money I wanted to make and I asked for it. It was given to me and I never looked back. If I don't believe that I am worth it, then who will? It is really easy to get drowned in self doubt, especially when you are taking a risk such as changing careers or working for yourself. But it is important for me to always reground myself in the belief that God has plans for me and with my continuous prayers to Him to guide me on this new path that I am on, I will be o.k. Wachob also believes in the power of visualization breaking it further down into three components: believing, seeing, and doing. I believe in myself. I can visualize myself being the person I want to be. I will work diligently to achieve my goal. Thank: Think about how you recount your day. How many of you start rattling off all the things that went wrong in your day? Did you even mention a single positive thing? Probably not. This year I really started work on myself to focus on the highlight of my day. I then recorded it in my MAMBI Happy Planner month view. That way I can always go back and remember that time in my life. Wachob also suggests keeping a gratitude journal much like how I write down the highlight of my day, write down one thing that you're grateful for. Comparing yourself to others is a sure fire way to be made miserable. Instead, chose to be thankful for what you have. You can't be truly wellthy unless you are able to feel grateful. One thing that I have always believed in is giving. Even when all I have to give is a dollar I give it. I don't care what they do with it. If they are in need and I am able to help I do. I have reaped the rewards of this habit time and time again. I can't tell you how many times I have been in need and money or help (or both) have manifested themselves in the most random way possible. Most recently while husband was laid off and we were still trying to pay for the wedding I randomly opened a box on my desk only to find $89 dollars in a red envelope that I guess I had stashed there at one point. It was such a blessing, a Godwink, and the exact amount that I needed to complete the monetary gift to our priest. Needless to say I sobbed and thanked God for His continuous love and guidance. This book really aligned itself with my core values and beliefs. I love when a book does that. It left me feeling more inspired and with a renewed belief in myself. If you are struggling with motivating yourself to take that next important step in your life, I highly recommend you reading this book. Pick it up here. *The copy of this book was sent to me for review by Blogging for Book. As always all opinions are my own. Thanks! I felt like if people understood how a book relates to you personally they are more apt to read it.